We went to the most beautiful wedding yesterday and just had to share some of the details with you. 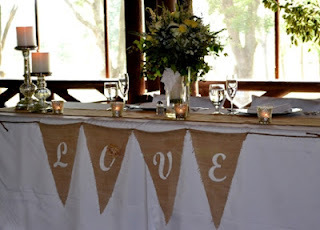 Remember the Wedding Shower Gift Post with the burlap I did several weeks ago? Well this was the wedding. 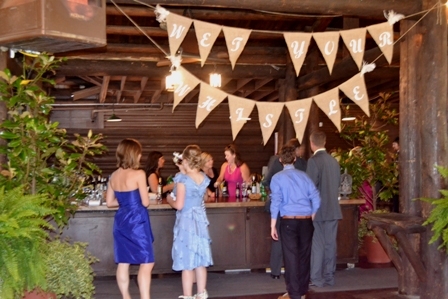 The bride and groom are both Eco friendly, earthy people and their wedding reflected their love for nature. The reception was held at a very rustic open air, beautiful, historic picnic pavilion that once belonged to the Hoover Company (of vacuum cleaner fame!) God blessed this couple with the perfect weather for their day. And also blessed both the bride and the bride's mother with an incredible eye for detail. They did a fabulous job with the reception, it looked like it was straight out of a magazine! So I couldn't help but share these pictures with you, I think you will enjoy it as much as I did! The only thing I can take any claim for - is the fact that I lent them the door we used at our daughter's wedding last year for the seating chart! 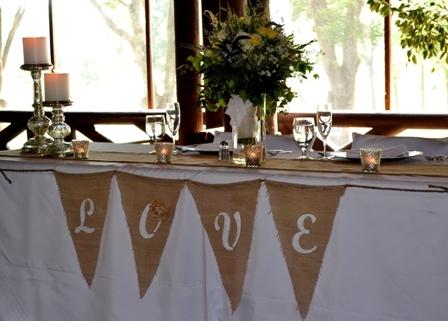 The Bride and Groom's table was adorned with burlap pennants, mercury glass, and her beautiful natural bouquet. Guest Seating had burlap table runners, battenburg lace chair covers, silver chargers, mercury glass votives, birch pots with herbs and a beautiful wildflower center piece. This picture is not the greatest, but the bar had pennants hanging inviting you to "Wet your Whistle". This Dessert Table was as delicious as it was beautiful. I love the use of the old suitcase and crates. Then add the lace tablecloth, the "Life is Sweet" Sign and the garland made from fabric strips the whole vignette was just gorgeous! We wish the best for the Newlyweds! Looks like a lovely wedding celebration! Thanks for sharing! How beautiful!! I love the door for the seating chart and all the burlap. I'm the wedding planner for my sisters wedding and we already have suitcases incorporated in our design. Weddings are so much fun!! Thank You for sharing. I'm having my very first blog giveaway and would be delighted to have you stop by! This wedding looks fabulously creative. Your door was my favorite. I love that they put the seating chart on it. Great idea. Thanks for sharing these wedding photos, it looks beautiful! I love the dessert table! Beautiful / glad you shared ! Dessert table is awesome ! What a great celebration. Weddings always makes me cry due to the feelings of romance and the beautiness. What a gorgeous wedding! I love all of it!! That door is amazing! What a a beautiful wedding... So many beautiful details. Thank you for visiting and commenting on my blog... You don't need to have dish envy...I will let you borrow them.